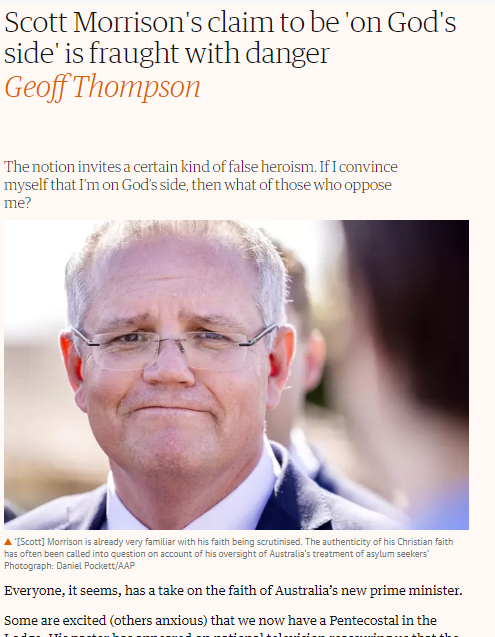 I've written a short piece for The Guardian about some aspects of how Scott Morrison understands the connection between his Christian faith and his political vocation. 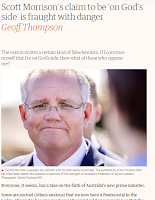 I raise note the dangers of claiming to be 'on God's side' in the context of the adversarial and partisan world of Australian politics (quite apart from it being theologically problematic in any case). I also think there needs to be some push-back against those Christians who see the elevation of their kind of Christian to top job somehow being a plus for Christians. I see matters quite differently. Deep in the logic of Christian faith is the idea that God is impartial. The only “side” that God’s takes (if that language must be used) is the side of all humanity. This, moreover, is why those Christians welcoming Morrison’s elevation to the prime ministership as indicating some sort of benefit to Christians are so wrong in their understanding of Christianity.